A few weeks ago, I bit the bullet and finally ordered a paint sprayer. I had been wanting one for a really long time, and honestly, it would have been great to have one when we were painting all of the doors on the first floor, but I was just not ready to purchase one yet. I was caught up in reading every review I could possibly find on all of the different types of paint sprayers and all the different brands. And then I thought I had found it, so I ordered it. It's known as The Critter. Bloggers have praised it, Amazon had amazing reviews, and it's price was amazing at only $50! Plus, it was just an attachment for an air compressor, which I already had. It arrived in two days, via my Amazon Prime subscription, and I immediately brought it downstairs into my basement workspace. Now, this little paint sprayer is quite creative - it uses mason jars as the paint containers, which means you could buy a pack of twelve at the store and have a container for every paint color you need! I filled up the jar with my white paint, thinned a little with water, as the paint manufacturer suggested, and hooked it up to my air compressor. 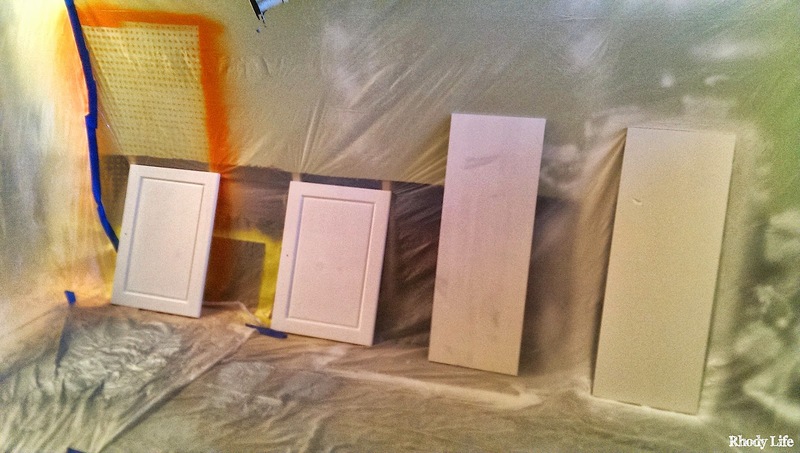 I let the compressor fill and when it was ready, I pulled the trigger to start spraying. Except, it didn't spray. I fiddled with the height of the nozzle and the opening in the straw, but it still wouldn't spray. I messed with it for an hour before I set it down for the night and gave it a rest. The next day, I started up with it again. I let the air compressor tank fill completely, and again, pulled the trigger. I messed with the nozzle, and finally got a little bit of paint to come out. I messed with the nozzle a bit more to see if I could get more to spray, but at that point, my air compressor ran out of air and needed time to refill. I spent a total of three hours trying to get this thing to work, and the best point that I got to was being able to spray for about 30 seconds, at which point my air compressor ran out of air. Most of this was the fault of the air compressor, as I guess it wasn't strong enough to power The Critter, but I still didn't like the paint sprayer. When I did get it to spray, it was the smallest line of paint I have ever seen. In fact, you can actually see some of the test sprays on the sheet in the right side of the picture below - they were that small. I was painting the shelves in the hutch that I was refinishing, and I was maybe getting two inches of paint on every line. Overlapping was causing drips and minimal spacing was leaving visible lines when the paint dried, especially since I was using a semi-gloss paint over a flat primer. It just wasn't working for me. The spray area was too small, and the fact that it didn't work well with my air compressor was enough for me to send it back. I'm sure that with the right equipment, The Critter would work really well, but based on the results that I saw, I believe that this sprayer would be best for detail work and not something large scale, like painting shelves, doors, or furniture. Back to researching. 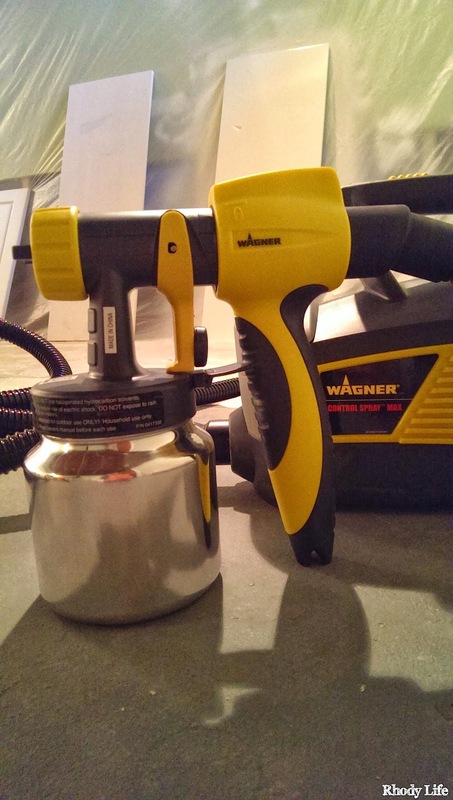 It didn't take me long to find a different paint sprayer, and although it was more than double the cost of The Critter, I decided to go with the Wagner 518080 Control Spray Max, which is actually a HVLP spray gun that has a built-in air compressor. Like The Critter, it was delivered in two days via Amazon Prime, and when it arrived, I couldn't get it out of the box fast enough. I was so excited to give it a shot. I pieced it together, filled up one of the paint containers with my semi-gloss thinned paint and tested the spray on the plastic protective sheeting I had hanging from the wall in the basement. And it worked! Amazingly and perfectly! All I had to was adjust the pressure of the spray to make it a little less globby and it was good to go. Painting one side of the shelf took approximately 15 seconds and it looked perfect. There wasn't a single drip, there weren't blotchy areas, the overlap was perfect without being too heavy, and I could even tilt it to the side to get into difficult areas and the paint would still feed through the straw! Best of all, though, was that it dried without streaks and with a perfect semi-gloss finish, just like I asked it to! I was in love, instantly, and actually, I still am. I have used this on shelves, doors, and actually full pieces of furniture and it has worked tremendously. And with the exception of it only coming with two containers, I am so happy with this spray gun that I couldn't recommend it more. I'm on the lookout for some additional containers that work with this model, and while I'm sure there are some available to purchase from Wagner, I'm wondering if there are any around-the-house items that may end up working, like perhaps an empty mayonnaise jar? Worth a shot, right? I can't wait to use this more, and I already have a ton of projects in mind, because not only will this spray gun work for paint, but you can also use it with stains and finishes, which means refinishing the futon frame we have may end up taking way less time than anticipated. And, I can throw away all those brushes, and never have to clean one out again! Not really, but this spray gun will certainly cut back on the amount of brush cleaning I will have to do, which is always welcome. Do you have a paint sprayer? What brand did you go with? Have you used it with products other than paint? Fill me in! Have you had a chance to use this sprayer for ceilings? I am thinking of purchasing if for a total repainting of my place, and I have popcorn ceiling that must be painted over. Worried that using this sprayer directly up would cause it to clog or not spray evenly. I haven't used it on a ceiling, but I did use it on the top inside of the hutch in the post above. I don't think that the sprayer would clog or not spray evenly, however, you would have to make sure that the paint level in the container is high enough that when the sprayer is tilted upwards, the straw inside is still taking in a good deal of paint. This means that you'll likely need to fill your container more than you normally would, which may be annoying, but may also end up not being as annoying as using a roller on your ceilings.